An Explosive Night of supercharged Nitro Fuelled Drag Racing action coming your way! Plus full fields of all your favourite sportsman racers battling it out in Round 5 of the WA Drag Racing Championship Series! SEATING AND MAP INFORMATION General Admission: Terraced grass section from 400-foot mark (just beyond one-quarter mark) to 1000 foot mark (three-quarter mark). No Pit Area access. Silver Area: Terraced grass section from behind start line, adjacent to start line all the way to half-track. Includes sun shade sales on western side. Also includes access to general admission area. Pit area access included. Gold Area: Reserved premium seats in stand in front of corporate suites near start line. Only gold area members can enter stand. Also includes acres to general admission and silver areas. Pit area access included. 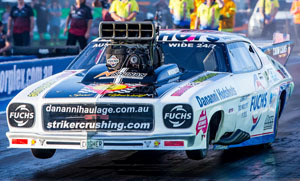 This event sees the Nitro Level go up a notch … These Rocket Ships are capable of exceeding 500 km/h in under 5 seconds as they thunder down the Perth Motorplex Quarter Mile. FEEL the noise as they launch from the Start Line with massive Nitro Flames shooting high into the sky. If you love NITRO and explosive Drag Racing action then get down to Perth Motorplex on Feb 2 to get your fix!